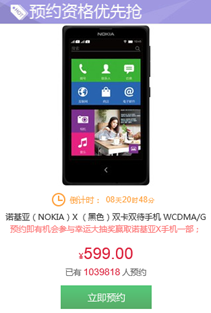 Earlier today Nokia “weibo’d” that the Nokia X had received over a million pre-orders for the first Android powered Nokia phone, and indeed it had, but that doesn’t mean that Nokia will sell anywhere near that many of the new devices. The pre-orders, all coming to Chinese retailer JD.com’s website, only required that you log in to the very popular retailer’s site, and click on a pre-order button. There were no forms to fill out, and no payment required to secure a device. On top of that, JD.com was running a contest offering a free Nokia X to one lucky winner chosen from the pre-orders, and customers could pre-order once… for each Nokia X color. The Nokia X will debut in China in black, white, and green, meaning that every person who wants to try to win (or even just rack up some impressive numbers) could pre-order up to 3 times, all for free with no obligation to actually purchase a phone. (The red text can be roughly translated as “once preordered you will have chance to win a Nokia X for free”, according to our friend PicturePan2 from LiveSino.net). The phone does sport an eye-opening price tag. 599 Chinese Yuan works out to be just a bit under $100 US. Not bad for a smartphone, and priced less than most comparable Android phones in China, according to PicturePan2. While it is impressive that the Nokia X garnered so much attention, to expect the new device to sell anywhere near those million pre-orders is probably wishful thinking, at best.